Breaking a bone can be an extremely painful and traumatic experience. For children, fracture injuries can be common and often heal easily. In adults, however, broken bones often involve much longer healing periods and painful complications, and they can pose a very serious threat to senior citizens. 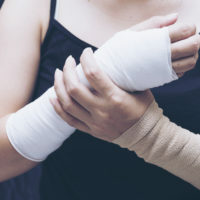 Learn more about fracture injuries below, and contact a knowledgeable personal injury attorney if you’ve been involved in an accident that resulted in a broken bone. With the exception of those with a medical condition, bones are quite sturdy and require a great deal of force to break. As a result, broken bones (known interchangeably as fractures) are often the result of a traumatic accident. Below are some of the most frequent accidents that result in broken bones. Falls from a height can result in impact fractures, where portions of a bone are forced into one another at the site of the break. Often, a fall victim will reach out their arm to catch themselves when they fall, often resulting in complex wrist or arm fractures to the extended arm. When victims land on their back or neck, they can break critical vertebrae in their neck or spine, or even their skull, resulting in life-altering injuries such as paralysis or brain damage. Car accidents can also cause serious fracture injuries. Car accident victims often break ribs upon making impact with the steering wheel or dashboard, or even a restrictive seatbelt. The delicate clavicle may also break if a car accident victim is thrown forward. Victims of rollover crashes may suffer broken arms or legs, as well. Fractures must be set quickly and competently after an accident. If a bone is set improperly or is allowed to heal without being set, this can result in a malunion or nonunion of the bone. Where the fracture is complex and breaks the skin, the bone may develop an infection. Osteoarthritis is frequently one of the long-term consequences of a fracture injury. When a fracture spreads into a joint, victims may experience symptoms of arthritis in that joint years later. Should the break damage a nerve or neighboring blood vessels, victims may have problems with circulation or sensation. Even when no serious complications develop, fracture victims often require months of rehabilitation to recover completely from their injuries. If you’ve suffered from a broken bone or fracture as the result of a traffic accident or slip-and-fall in New York, contact the seasoned and compassionate Hudson Valley personal injury lawyers at Rusk, Wadlin, Heppner & Martuscello, LLP for a consultation, in Marlboro at 845-236-4411, or in Kingston at 845-331-4100.